Do you find yourself saying things to your child during an argument without even thinking about it? Let’s face it, it’s almost impossible to be detached or objective when your child is in your face fighting with you. And naturally, it feels like a personal attack when he’s saying rude things or calling you names. During those moments, it’s all too easy to respond with something hurtful. All of a sudden, your feelings take over—your emotions jump into the driver’s seat and your thinking moves into the back seat. What comes out of your mouth doesn’t always get into your child’s ear the way you want it to. 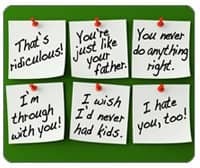 Almost every parent has gotten mad and said things to their kids they wish they could take back. The trick is to figure out how to remain in control so you don’t end up saying something you’ll regret. Though this is easier said than done, trust me, it is possible—and it’s a skill you can learn, just like anything else.